Here’s Chuck Marohn’s annual list of his favorite books he read in 2018. Kea Wilson shares her five favorite Strong Towns-adjacent reads (and one favorite watch) of the year. From the short works of Jane Jacobs to a nonfiction epic about Americans who live out of their cars, and more! Last week, the McAlvany Weekly Commentary featured economist Tomas Sedlacek. I've never heard him -- or any economist like him -- before. Mind = blown. Here are the top 4 books that Chuck read in 2015. Some off topic thoughts and a video inspired by the book The Better Angels of Our Nature: Why Violence has Declined by Steven Pinker. I've been trying to place the Strong Towns message in historical counterparts. I want to know in which other context these ideas emerged, who led them, how, and how did it turn out. Every year I'm asked to recommend my favorite books from the past year. I love to read and go through a crazy amount of literature in twelve months. I've tried to go back and catalog my reading list from 2014 for you on Pinterest. Here are my favorites from that list. If you're looking for one book that explains the transformation taking place in our cities, towns and neighborhoods it is Leigh Gallagher's new book The End of the Suburbs: Where the American Dream is Moving. Gallagher's straight forward, reasoned tone and meticulous research give her credibility when writing on subject matter that pretty much every American already believes they are an expert at. The book will challenge the pre-conceived notions of most, however, but do so in a way that is affirming of the American experience. This is the most important book of 2013. 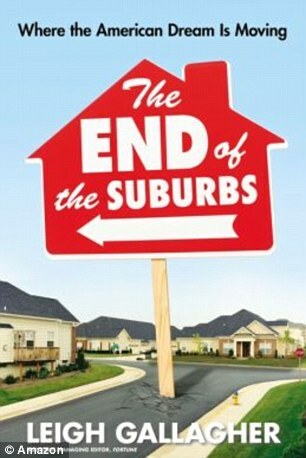 Welcome to those of you that have found us through Leigh Gallagher's great book, The End of the Suburbs. As stated in the book, Strong Towns and the Strong Towns movement began right here with this blog. We still post at least three days a week (Monday, Wednesday and Friday) along with a new video each Tuesday and a podcast on Thursdays. If you want to get caught up on what we're doing here, you can check out the Strong Towns 101 info (see the drop down menu) or you can get a copy of the book we published last year. 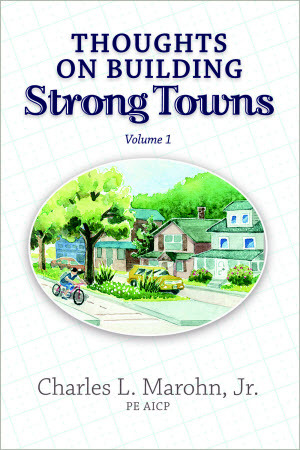 Thoughts on Building Strong Towns contains some of our best essays and is a good primer for Strong Towns thinking. A couple of years ago I received a call from a reporter from Fortune magazine. She was well informed on Strong Towns and the related issues of growth and development. She also asked good questions. These are both rare attributes I appreciated greatly. We had a very enjoyable conversation and I remember hanging up with an unusually positive sense of where her work was going, although I could not have guessed that she would go on to author the most important book of 2013. That reporter was actually the Assistant Managing Editor of Fortune magazine, Leigh Gallagher (Twitter/LinkedIn). Her book, The End of the Suburbs: Where the American Dream is Moving, is the work that America has been waiting for. It is timely, well researched and delightful to read. I can't recommend it enough. This is a topic that only a journalist could fully capture, and Gallagher does it expertly. She explains the trends that show suburban expansion waning without coming across as bashing the burbs. She breaks down why millenials and baby boomers are preferring urban living -- and the implications for the future sales of all those suburban houses -- with cool fact and icy reason. The most refreshing thing about this book is not the data -- although that is impressive -- but the tone. This is a book my retired school teacher parents would read, two people that grew up in a suburbanizing America and still live on the hobby farm on the edge of the city. They'll read it and not be offended when Gallagher explains that their way of life is highly subsidized, socially engineered and quickly becoming passe. She has a gift when it comes to explaining things that professionals have known for years yet been unable to communicate to the public. That makes this not only the most important book of 2013 for our society, but a critical public policy document as well. If you want to do your community a favor, purchase each of your council members, planning commission members and senior staff a copy. From my vantage point, Gallagher's work is going to be like a therapist for them, telling them what they need to hear in a way they will be able to accept and act upon. For Strong Towns advocates, there could hardly be a more powerful communication device. That initial conversation I had with Leigh Gallagher preceded many more phone calls, emails and even a delightful breakfast conversation when our paths crossed. Each time we spoke I became more excited because I could see in her questions and comments that she was piecing it all together. With the zeal of a great reporter, she talked to everyone and fully immersed herself in this conversation. I'm so impressed by how hard she worked, something that will be apparent when you crack open the book. This past spring I was in Miami for a speech and I had the occasion to stop by the DPZ office. When Andres Duany saw me he pointed at my face and said, "I know you. What is your name." When I told him he said, "That's right, you're in this book." He reached into the mess of his desk and fished out an early copy of The End of the Suburbs. "This is going to be the most important book on the New Urbanism, maybe ever." We sat on a picnic table outside and, in the course of our conversation, he used a phrase with me that would end up as part of his blurb on the cover. "This book is a steel fist in a velvet glove," he said. As ever, Duany is brilliantly insightful. If you're looking for one book that explains the transformation taking place in our cities, towns and neighborhoods it is Leigh Gallagher's new book The End of the Suburbs: Where the American Dream is Moving. Gallagher's straight forward, reasoned tone and meticulous research give her credibility when writing on subject matter that pretty much every American already believes they are an expert at. The book will challenge the pre-conceived notions of most, however, but do so in a way that is affirming of the American experience. This is the most important book of 2013. I highly recommend you get a copy today. There are countless people working today to solve the myriad of complex problems we face in America. Few are as bold, yet practical, as a new initiative from www.street-sense.org called Investment Ready Places. It is one part triage, one part aspiration. It is exactly the kind of thinking we need right now. For those of you in the Boston area, I'm giving a lecture tonight at MIT. It is open to the public and while we are expecting a full house, please don't be afraid to swing by. If you are already part of the club here, make sure you introduce yourself. The contributors at Street Sense -- Kevin Lavelle, James Michael, Joseph Nickol and Atul Sharma -- have just released Investment Ready Places: A guide to community building in the New American Frontier. The booklet is a CNU NextGen initiative so I've had a little glimpse under the hood as this was being put together. Still, like many of the things NextGen members are working on, I really didn't fully understand where they were headed with this until it was released last week. It is really powerful stuff. For those of us working in these areas, this statement is obviously true, yet it runs counter to the narrative we constantly hear about small and mid-sized towns. Small towns are dying where they are not already dead. Everyone is moving to cities. The rural brain drain. It goes on and on. And certainly, almost all small towns are bankrupt, if not literally insolvent than functionally. The Ponzi Scheme of Suburban Growth has been particularly vicious to small and mid-sized towns, where a flattening of the development pattern has decimated their most productive areas in the core while adding disproportionately enormous liabilities on the edge. It all shows. Many of these places look like their days are numbered. A size and scale that is amenable to retooling. That third component is key. An Investment Ready Place does not have the same connotation as a "shovel ready" project, either in terms of the immediacy or their ultimate potential (there was a reason those projects were not getting built during normal appropriation cycles). An IRP is a place that is ready for some love. And most importantly, it is ready to love back. Mid-tier towns and cities are our most dynamic urban settlements and have the largest untapped potential for fostering economic growth. They vary in size from a town of a few thousand people to small cities with a couple hundred thousands residents. They are small enough to be affected by incremental change and large enough to afford opportunities to create substantial impact. They provide us the stimulus of direct action followed by relatively quick, tangible change. Change is an important part of the IRP equation. We're not talking about places that are ready for that new highway investment, the strip mall or housing subdivision. The report lists six characteristics of Investment Ready Places that need to be in place, or in development, to attract productive investments. The report explains each characteristic and gives detailed strategies for achieving them. They take a number of plays out of the Strong Towns playbook, including Manageable Infrastructure strategies that direct a city to "build infrastructure proportionate to the ability to finance and maintain it" and "fully capitalize on current infrastructure for development prior to building expanded systems..." This is common sense yet so unorthodox within the current approach. The best part of the booklet is a checklist at the end that goes through each characteristic and gives community leaders -- and potential investors -- metrics on which to measure the level of community readiness. Pulling no punches, the lowest rating is "look elsewhere". Apolitic as that may be, investment looking elsewhere is exactly what is happening to places that cling to the Old Economy model. At its core, Investment Ready Places is a call to tap the enormous potential and high-returns that still remain from the traditional development pattern. This is truly a Strong Towns approach. Last October I had a run of good timing. The video of my TEDx talk on the important difference between a road and a street was released and, a week later, we released the companion booklet to the Curbside Chat. Both of these efforts brought us and the Strong Towns movement a lot of attention and, through it all, we caught the gaze of one of the people I admire greatly, James Howard Kunstler. I've met Jim before at the Congress for the New Urbanism. I blog during CNU and so I sit in the front and, when Jim sat down beside me, I made it a point to shake his hand and greet him. Like a giddy school kid, I even blogged about the experience. I'm sure he would find that amusing. Last October I got an email from Jim giving me some praise about the TEDx video and the Curbside Chat booklet. He kind of casually threw out the idea that we could someday do a podcast together. I may be a giddy school kid at heart sometimes, but I'm also an opportunist. A chance to have an extended conversation with one of my favorite social commentators was one of those experiences I had to pounce on. I emailed him back and said I'd come to his place -- or Duncan Crary's -- and we could make that happen. Now I was going to be in New York on business, and I've always wanted to see upstate, so this was something I could have fit into my schedule. Unfortunately, I think I came across as a little over eager, especially since when I said I would "drive up" Jim apparently assumed I meant from Minnesota. He thought that was ridiculous -- told me so in the way you would imagine him doing -- and that's kind of where things ended. Fast forward to 2012 and I'm sitting here with a copy of the KunstlerCast book written by the host of the program, Duncan Crary. The two of us are Facebook friends and, in chatting with him about the book, he agreed to come on the Strong Towns podcast. We were able to pull that off this week. I want to take the blog post today and make sure that those of you that don't subscribe to the podcast know that the interview is there. I thought it was fun and it turned out really well. Duncan is a good subject for an interview. He made many thoughtful and insightful points that you don't often get a chance to hear from him on the KunstlerCast. Click here to stream the podcast interview with Duncan Crary. Although we've never met in person, I feel a little bit of a kindred spirit with him. We are both of Generation X and, while he laughed at my use of the term "slacktivism", we've both chosen to live in small towns and to, in our own non-traditional, Gen X way, push for change in those places. While my parents (and his parents probably too) would scratch their heads at the idea of spending significant time on a river barge this summer to write about the experience, I totally got where we was coming from when he said that was one of his upcoming projects. Hopefully we'll do another interview when that book is out. A few things about Duncan. Not only is he the host of the KunstlerCast, but he runs Duncan Crary Communications where he does P.R., publishing and all-around assisting with communication projects. He comes across as a very down to earth guy; someone who believes in what he is doing but doesn't take himself too seriously. If Jim Kunstler is the court jester -- a title he has given himself that has far deeper significance than simply "clown" -- then Duncan is the town crier. These two are a great team. Finally, I have to recommend the book Duncan has written. I'll admit that I was skeptical when I heard he wrote a book about conversations from the podcast -- how interesting could that be? Having read it now, I can say that it is very good. I'm immersed in this stuff and I learned new things from it. For those of you wanting a good overview of Kunstler's thinking and for those of you that want to share JHK with others but may fear being embarrassed by the sometimes "salty" language he can use, this book is a great tool. The format is, by design, conversational. You can digest it in small bites or in large pieces. And the Kunstler world through Duncan's eyes is not necessarily sanitized, but it is communicated in a way that I think will reach a broader audience. Plus, it is dirt cheap. You should really buy one for each member of your city council. If you would like to know more about how to apply Strong Towns thinking to your community, join us at the Strong Towns Network, a social enterprise for those working to implement a Strong Towns approach. Is the challenge facing our local governments one of efficiency -- do they lack the systems to make good use of resources -- or is it one of innovation? If it is efficiency, then consolidation can address those problems. But if what we need is more innovation, we have to find a way to unleash local governments to make little bets - low risk experiments in solving problems. We want to say thank you to Amy Brendmoen for supporting Strong Towns. We depend on the donations of our readers to support this blog, the Strong Towns podcast and everything else we do here online. If you'd like to join Amy in supporting Strong Towns, you can make a tax-deductible donation on our website. Strong Towns is a 501(c)3 non-profit organization. We are comfortable with the notion of consolidation here in the United States, especially in times of financial difficulty. When big airlines get in trouble, two of them will merge together with talk of efficiency and elimination of duplicating services. When the big banks got in trouble in 2008, the Federal Reserve and U.S. Treasury encouraged J.P Morgan to buy Bear Stearns and Bank of America to acquire Merrill Lynch. Again, the talk was all about how the new, larger entity could leverage resources for efficiency gains. We see this repeated in auto companies, telecommunications and media conglomerates as well. Bigger is better. Or is it? If there is one thing that airlines, auto companies and telecommunication companies seem to have in common here in the United States it is a lack of innovation. For the latter, anyone who has been outside of the country and marveled at the ubiquitous cellular service can attest that we have terrible coverage here in the United States. When General Motors failed it was widely acknowledged that they were building an inferior product. And while we may get innovation in the too-big-to-fail banks, it is typically of the swindling variety. If consolidation creates efficiencies, the tradeoff is the bureaucracies become bigger, more entrenched and less likely to be naturally innovative. Where companies have overcome this -- for example, a company like Google or a Minnesota example like 3M -- they have typically walled off departments into a company within a company or placed a very high value on individual experimentation. Google, for example, asks their engineers to devote 20% of their time to their own projects. But most companies are not Google. Or even 3M. The fact that no local government runs like a company has not kept politicians from talking about consolidation as a big part of the answer for tight budgets and failing towns. While I'm aware of the rumblings here in Minnesota, where the state proscribes the taxing policy and spending approach for all cities, a quick search revealed many places where consolidation is being discussed. In Rhode Island, the state has set caps for local government spending increases while at the same time increasing mandates and cutting aid (a sadly familiar story). When too many cities requested waivers of the cap, people like Dr. Edward Mazze, a professor from the University of Rhode Island, suggest consolidation as the answer. Mazze said the state should go back to the drawing board, arguing that it might be time to once again consider some form of consolidation. Mazze said a five county government could save millions of dollars for taxpayers. In New Jersey there is a 501(c)3 organization that has been established to advocate for consolidation. They recently issued a guide for cities looking to go through the consolidation process called Courage to Connect. Governor Chris Christie has signed legislation making it easier for towns to consolidate. The word "innovation" seems perilously overworked these days, invoked by corporate leaders and earnest politicians eager to signal progress and express faith in our ability to solve problems and improve the world. We're always ready to endorse the concept, though applying it may be another story. "I'll be happy to give you innovative thinking," a bedraggled employee tells his boss in a classic Leo Cullum cartoon. "What are the guidelines?" Guidelines are what Peter Sims seeks to provide in "Little Bets," an enthusiastic, example-rich argument for innovating in a particular way—by deliberately experimenting and taking small exploratory steps in novel directions. Some little bets will not pay off, of course, in which case little is lost; but others may pay off in big ways. At the local government level, we don't have a lot of innovation going on. We have competent and less-than-competent management, but we don't have innovation. That is not because our people are not innovators. It is because states typically mandate, regulate and manage affairs at the local level to the point where only a narrow band for innovation typically remains. Consolidation is a response to inefficiency. At the local level, inefficiency is not our problem. Lack of innovation is. We have the same template of codes, regulations, budget approaches, software, staffing, street standards, policies, etc... in nearly every city in the country. Who is truly innovating out there? As we go through this great transition, as a society we really need to clarify what we expect from local governments. Do we expect them to operate as utilities, essentially do a few, simple things well and leave it at that? Or do we expect them to take on more. Do we expect them to be the front line for developing new solutions to the problems we face? If we want the utility approach -- efficient but dumb -- then we need to strip away much of the responsibility we have given local governments and simplify their responsibilities down to just a few. Let them plow streets, mow grass, run park programs, collect water bills and run elections. Leave all the planning, zoning regulations, infrastructure investments, economic development and tax matters to someone else. But if we are going to demand more from cities, then we need to get out of the way and let them become platforms for innovation. We need to remove the mandates (go ahead and replace them with measurable outcomes). We need to get rid of the parochial regulations. We need to allow local governments to experiment with different approaches knowing that many of them will not turn out well but that some of them will. Those that do will create the innovations for everyone else to adopt, customize and improve upon. That is how little bets can create big change. Cognitive dissonance is where one holds two competing thoughts in the mind at the same time. The idea that the economics of our system of living is forcing us to contract does not correlate with the popular political notion of getting America growing again. Would cognitive dissonance be an incremental improvement over the blind ignorance our political establishment seems to have of our current situation? We want to thank the Blandin Foundation for their support of the Strong Towns movement. The Blandin Foundation has challenged us to demonstrate support for our work by raising $50,000 over the next twelve months, which they will then match. If you find value in what we do here, we ask that you support us with a contribution and help us spread this message further. I finished two books last week. The first was The Icarus Syndrome: A History of American Hubris by Peter Beinart, which talked about how America’s view of foreign interventions has evolved from Wilson through George W. Bush. The second was Endgame: The end of the debt supercycle and how it changes everything, by John Mauldin. Endgame is a sobering, but far from apocalyptic, look at what comes next for a global economy unwinding from a massive accumulation of debt. It was the overlap of these two fascinating books that got me thinking about the politics of what someone like James Kunstler calls The Long Emergency, what Richard Florida called The Great Reset and what I would probably categorize as an end to the Suburban Growth Ponzi Scheme in America. Politics weighed heavily in Beinart's and Mauldin’s books, but not the petty kind that you see on cable or the horse race kind associated with straw poll results. I do a weekly radio segment on Minnesota politics (Thursdays at 7:20 AM on Northern Community Radio, 91.7 KAXE) and I have little patience or interest in that side of it. What fascinates me are the policy decisions; how those deep and enduring choices are made, intentionally or not, by the people in a position to make them. Beinart revealed that, throughout history, American leaders often understood the problems but faced the supreme obstacle of bringing the American people along with them. Whether it was the idealism of Wilson, the level-headedness of Eisenhower, the savvy of Kennedy or the ability to connect of Reagan, the Icarus Syndrome portrayed leaders that were looking beyond the public mood to a place where America would be better, if they could only lead us there. Of course, the story or Icarus is of a boy that, empowered with wings, flies so high his wings melt and he is sent crashing back to earth. With Beinart, for Wilson there is Truman. For Kennedy there is Nixon. For Reagan there is G.W. Bush. The latter each take the vision and prudence of the former and, freed from the burden of public opposition (which was eroded by the former's success in more limited ventures) they advance to new "heights" only to come crashing back to reality (ie. Korea, Vietnam, Iraq). So here's my thought problem: Do America's leaders today know and understand the problems we face but, because it involves so many difficult choices, basically avoid talking about it directly to us (Wilson, Kennedy, Reagan) but instead are working behind the scenes to slowly move us in the right direction? If I am given thirty seconds to summarize where our economy is at, here is how I do it: Following World War II, we turned our massive economic capabilities into building suburban America, a great experiment in creating prosperity. We were successful for a time, at least for some, and it made us the envy of the world. As our model started to break down in the mid-1970's, we turned to debt and financial gimmickry to keep it afloat. We've just about run out of our ability to do that, with households, companies and governments all massively over-indebted. When this ends, we will need to deal squarely with the mess we have made; our loss of productive capacity, our consumption-based economy, our reliance on the automobile and oil, the unproductive places we've built, our social fragility... Our current economic problems are not just a transient condition or some part of a natural business cycle. They are the beginning of a great unwinding that will result in the physical contraction or transformation of our very cities and towns. I think much of this is -- or should be -- apparent to our leadership. The rhetoric they use suggests that we are in the throes of one of humanity's epic struggles, that the very future of America's Republic is at stake. The term "structural change" has been in common usage for some time now. They have to see this stuff, don't they? I'm starting to believe that they don't. The entire article is like this. Free trade agreements? Tax incentives? It does not sound to me like anyone grasps that there is a bigger issue here, that there is more going on than just a pesky economic slowdown. The President even indicated that he had reversed the recession, that we were on the path to recovery, until some "bad luck" in Japan, Europe and Asia set things back. The other side of the aisle is no better. GOP front runner (and fellow Minnesotan) Michele Bachmann actually suggested that, if she were elected, not only would the economy be fixed in three months but we would be back to $2 per gallon gas. The Tea Party may have put their finger on the biggest problem of our time -- the unsustainable level of indebtedness -- but in all other facets their proponents are in denial of reality. There is no serious narrative here about changes to the suburban experiment. The record of Rick Perry does little to bring comfort either. The publication Chron.com is doing a four part series on infrastructure investments in Perry's Texas. It is clear that Texas is in the second phase of the three-phase Suburban Ponzi Scheme -- the phase where debt is used to extend the illusion of prosperity -- with Perry himself not only in denial, but advocating for even more. As governor, Perry advocated the controversial Trans-Texas Corridor, an ambitious transportation scheme that relied on foreign investment and tolls for financing. It was abandoned after the outcry from property owners whose land would have been claimed by eminent domain. Since then, the state has relied heavily on issuance of bonds to build highways. For the first time in history, the Texas Legislature this year appropriated more cash to pay for debt service than to pay for actually building new roads: $850 million per year versus $575 million. Lawmakers also approved the use of $3 billion approved by voters in 2007 for road construction, but the Texas Department of Transportation estimates the state must pay $65 million in annual financing costs for every $1 billion it borrows through the sale of bonds. The state began borrowing money in 2003 to pay for roads and will owe $17.3 billion by the end of next year, contributing to the rapid escalation of total state debt, from $13.4 billion in 2001 to $37.8 billion today. The money will cover just a fraction of the transportation needs identified by planning experts. The Texas Transportation Institute two years ago placed the state's highway construction needs through 2030 at $488 billion. Even here in Minnesota, we have this weird political cabal to support the Old Economy Project that Refuses to Die (also known as the $700 million St. Croix Bridge in Stillwater). The bridge is three times the cost of the 35W replacement and will carry only a tenth of the traffic. It requires a waiver from Federal Wild and Scenic Rivers protection. The constituency here is a small town on the far edge of the Twin Cities Metropolitan Region and some property owners in the neighboring state of Wisconsin. For Minnesota's politicians left and right, there are numerous reasonable grounds to oppose this project, or even just shrug shoulders and say, "wish we could, but we can't." Instead, Republican representatives Bachmann and Cravaack have joined with Democratic Senators Klobuchar and Franken and Democrat Governor Dayton to support the entire project. A last minute face-saving "out" for the Governor was even rejected. If there is any understanding anywhere in government that the suburban experiment is ending, why would we be pushing so hard to spend so much on its last gasp? Mauldin's assessment of the debt supercycle relies less on politics and personalities than Beinart's work in the Icarus Syndrome. He used the "kick the can" metaphor frequently, but even he limits his analysis to the financial statistics, overlooking the impact of energy, population growth and other finite resource-based issues. The future he paints is filled with the pain of a difficult transition. I, for one, would be happy if our politicians could just acknowledge that much. Could it really be that our political establishment is so blissfully unaware of what is really going on that cognitive dissonance -- having two competing ideas in ones head -- would be an improvement? We rely on you to fund this blog. If you stop by here very Monday for some fresh ideas on building Strong Towns, please consider supporting our efforts. Even the smallest donation has big ramifications for what we are doing. We're often asked to recommend books to people wanting to learn more about our thinking here at Strong Towns. I have also found that, in this blog and in other places, I continuously refer to a set of books and authors over and over. I've compiled a list of essential reading material -- the books that have most influenced me -- and have created a page on the Strong Towns site called "Essential Reading" for those of you that may be interested. The service that we use to compile the web site has a feature that pulls the information on each book straight from Amazon (good if you are an Amazon Prime kind of guy, like me). There is no particular order to the list. Each one comes highly recommended. Back with something from Jon Commers tomorrow. When we are delivering the Curbside Chat presentation, one of the most eye-opening parts for people is when we go through the concept of the Growth Ponzi Scheme. While there is a degree of abstraction with the concept that I originally feared might pass over the audiences, I have been pleasantly surprised that most people immediately get it. The "it" is this: Our entire economic system is based on an assumption of never-ending, always-accelerating growth. Of course, this assumption is tragically wrong. One of the things we describe in the Curbside Chat is how our economy, in an effort to maintain the Ponzi Scheme, shifted in the 1970's/80's from a layaway approach to a credit approach. We've spent our savings, today's earnings and now tomorrow's earnings propping up this financially unsustainable lifestyle. Anyone with a pencil and a ruler can show you how this is not going to end well. The Oil Drum's mission is to facilitate civil, evidence-based discussions about energy and its impact on our future. We near the point where new oil production cannot keep up with increased energy demand and the depletion of older oil fields, resulting in a decline of total world oil production. Because we are increasingly dependent upon petroleum, declining production has the potential to disrupt our lives through much higher prices and fuel shortages. The extent of the impact of this supply shortfall will depend on its timing, the magnitude of production decline rates, the feasibility of petroleum alternatives, and our ability to curtail energy consumption. They have had a couple of extra-fascinating posts recently on this topic of the need for growth inherent in our system. On September 17 they posted EROI, Insidious Feedbacks, and the End of Economic Growth, where they correlate our rates of economic growth with the cost and supply of energy. Economic growth over the past 200 years has correlated highly with energy consumption (Figure 1). Even more telling, since 1970, 50% of the year on year change in GDP in the U.S. is explained by the year on year change in oil consumption alone (Figure 2). This is important because oil consumption per se is rarely used by neoclassical economists as a means of explaining economic growth. Figure 1. Energy production and GDP for the world from 1830 to 2000. They point out that times of economic expansion have correlated with times of low oil prices, while times of contraction have included the converse. In other words, economic growth in our current model requires cheap energy. This is obvious to anyone with a 45-minute commute from the suburbs -- or anyone who builds and sells them homes -- if they stop to think about it. Yesterday The Oil Drum posted Systematic Risk Arising from a Financial System that Requires Growth in a World with a Limited Oil Supply, which explained in non-alarmist terms how that, even if the oil is there, if it is more expensive to extract it is going to cause all kinds of problems for our economy. These problems are directly related to the fact that we have placed huge bets in the present on massive rates of growth in the future. Our current economic system includes a huge amount of debt. Money is loaned into existence. Debt is used to finance many business expansions. Governments rely heavily on debt. The US economy has been growing for many years, with only brief interruptions, so nearly all of our experience with borrowing money, and paying it back with interest, has been during periods of economic growth. Borrowing from the future is relatively easy when the economy is growing, because when the time comes to pay back the debt, the debtor’s economic condition is likely to be as good as it was when the loan was taken out, and may even be better. So defaults are relatively uncommon, and the growth in the economy between the time the loan was taken out and the time it is repaid provides some contribution toward the interest payments. But what if we start encountering a very different kind of world, one with a decline in oil supplies? If oil resources constrain economic growth, debt defaults can be expected to rise, and the whole debt system underlying our financial system is at risk. Insurance companies are very much at risk too, because many of their assets are bonds. In the past, these bonds would have been repaid with interest, but in a world with little economic growth, and perhaps economic decline, the risk of default becomes much higher. Even if we should discover a way around our problems—say a new technology, which permits more oil extraction at lower cost, or a better substitute for oil, financial institutions--including insurance companies--are still likely to encounter substantial systemic risk related to debt defaults in the next few years. We have not put ourselves into a very strong, resilient position by being fully leveraged, dependent on growth to pay back that debt and, at the same time, dependent on cheap energy to attain that growth. It is not likely we will ride a virtuous wave of low energy costs and high growth rates that will allow us to pay back these debts. In fact, if we did catch such a wave, our system would have us then place even bigger bets on the future. If you include The Oil Drum in your regular reading list, you'll grow to understand why our towns and neighborhoods need to quit the Ponzi scheme and start building Strong Towns. The Strong Towns Blog; It's like reading Jim Kunstler, except you can share it with your mom. Sign up for a Curbside Chat, our project to bring the Strong Towns message to towns and neighborhoods across America. You can also join us on Facebook and Twitter. The part of this book I found the most intriguing was not the dissection of our current financial situation but his recommendations for reform. The Great Reset by Richard Florida is an amazing book that articulates in a convincing and eloquent way many of the principles we espouse here at Strong Towns. We highly recommend this book to anyone that wants to understand the relationship between how we have organized ourselves across the landscape and the prosperity we now find so fleeting. The book is a quick read, unless you pause on every other page to consider the implications of what you are reading (which you likely will). Florida's approach and critique of America is neither anti-American nor anti-modernity. In fact, the thing that is most refreshing about it is that he provides a narrative that is quite American, putting our current financial crisis - and it's fix - into the correct historical context. For example, he discusses the long depression of the 1870's and how it marked a reset in our economy. Innovations of production had outpaced our ability to make use of them. What was needed, and what occurred, was a reorganization of society. There was a massive migration from the farm to cities where work was available in factories. Only when this migration occurred did we see the productivity gains and enhanced prosperity of that the innovations of industrial production allowed. The same trend can be seen with the Great Depression of the 1930's, where suburbanization reset the landscape, clearing out much of the old industrial cities and distributing people across the landscape. Perhaps most amazing about the story is all of the technological innovation that occurred during the Depression. It took a spatial fix - suburbanization - to actually utilize that technology in a productive way, which helped the economy grow again. Understanding these past events, it is easy to see the current crisis as "suburbanization run its course". Cramming more and more people into industrial towns in 1935 would not have created a vibrant economy (it would have simply driven down wages even further). As we repeatedly say here, doubling down on our current suburban model of development is not going to bring about a new prosperity today. We need a different model, and as Florida explains, it needs to spatially respond to the demands of the new economy. Our own collapse, in the early years of the twenty-first century, is the crisis of the latest economic revolution--the rise of an idea-driven knowledge economy that runs more on brains than brawn. It reflects the limits of the suburban model of development to channel the full innovation and productive capabilities of the creative economy. The places that thrive today are those with the highest velocity of ideas, the highest density of talented and creative people, and the highest rate of metabolism. "Velocity" and "density" are not words that many people use when describing suburbia. So instead of chasing smokestacks - the old model - our towns should be investing in ways to make their places more connected, more dense and more vibrant. Our towns and neighborhoods need to become idea-creation machines. It is hard to put into words how counter-culture and revolutionary that thinking is in most parts of our country. I think the revolutionary nature of the reality he suggests can be captured in this short excerpt talking about the impact of arts on creating an idea economy. The challenge on the jobs front is twofold. It's obvious that we need to grow more jobs that are high in analytical and social skills, but we also need to increase the analytical and social skills of the jobs we have. But public policy toward the economic crisis seems unaware of this. Less than a month after taking office, the Obama administration unveiled its massive stimulus package--a staggering three-quarters of a trillion dollars aimed at recharging the lagging American economy. In the Senate debate over the arts component of the original stimulus bill, a relatively small amount marked for the National Endowment for the Arts (NEA) was deried as wasteful pork-barrel spending, which strikes me as ludicrous. As Jack Kingston, a Georgia Republican, put it, "We have real people out of work right now, and putting $50 million in the NEA and pretending that's going to save jobs as opposed to putting $50 million in a road project is disingenuous." That is ludicrous. Arts are an important component of the creative economy engine. The economy benefits from considerable spillovers and synergy as art and design expertise combines with technological know-how, producing all kinds of inventive new goods and services. A quick accounting of the products created by this dynamic intersection of art and science in just the last few years includes iPods and video games, blogs and e-books, virtual music studios and on-line universities. If we want to grow these kinds of technologies and new industries, we need to spend less time and effort bailing out and stimulating the old economy and a lot more on building the new. Again, Florida is articulate and right on the mark, even though it runs so contrary to the standard orthodoxy of modern America. All of those cities that are closing their library, laying off their parks director and defunding their schools are going in the wrong direction. This is especially true if they are diverting their resources to propping up a system built around new infrastructure on the periphery, fighting congestion and doling out business subsidies. Read this book, especially if you are struggling for answers as to what can be done to make your town a Strong Town. On our Thursday off-day (we typically publish M, W and Fr here on the Strong Towns Blog) I wanted to recommend a quick read that will help you make sense of the housing side of the current financial crisis. The book is called And Then the Roof Caved In: How Wall Street's Greed and Stupidity Brought Capitalism to Its Knees by David Faber. Faber is a journalist with CNBC and he provides not only some unique insight but a thorough and detailed progression of the problem that literally starts on Main Street and ends on Wall Street. It takes some complex material and organizes it in a way that should make sense to the average reader, even those without a strong financial vocabulary. Check out the new podcast today on Agrarian Urbanism and, when you are done, pick up this recommended book for a good weekend read. A fresh news digest tomorrow. I don't know as Kaid Benfield and I have ever voted for the same person for president. I write that not to highlight our philosophical differences but to demonstrate how the solutions to many of our problems have become so obvious that thoughtful people from across the spectrum can agree on them. Kaid Benfield is one of those thoughtful people. So if this guy gets us, I thought I should plug into what he was writing and see if there was something there I could learn from him. That was a very good idea on my part. His writing is intelligent and his approach is thoughtful. His recent post on the environmental paradox of smart growth is the perfect example of this. In the article he offers the standard environmental argument that "sprawl" is terrible for the environment. (We agree.) But then Benfield goes on to challenge the orthodoxy by suggesting that the answer is MORE development, not less. The key operative is that the "more" is not more sprawl (which we agree has disastrous environmental consequences) but more urbanism. Here at Strong Towns we approach the issues of growth and development primarily from a financial standpoint. NRDC approaches those same issues from an environmental perspective. Yet here we are in total agreement that the solution is better urban development and an end to low density sprawl. While we will likely continue to not vote for the same person for president, I have no doubt that if Kaid Benfield and I were magically appointed co-presidents-for-a-day, together we could solve half the country's problems by noon. That fact alone gives me a lot of optimism about our future. You can read Kaid Benfield daily, and we recommend you do, at http://switchboard.nrdc.org/blogs/kbenfield/.